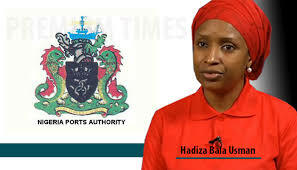 New Managing Director of the Nigerian Ports Authority (NPA), Hadiza Bala Usman, on Monday told her subordinates that her leadership would accept nothing less than the best service, saying Nigerian Ports can be made world class. The New boss stated this in a remark shortly after she took over the mantle of leadership of second largest revenue gate of the country in Lagos today. According to her, “the country expects much from us all.Our ports are a critical artery of the economy, and it is our duty to ensure that the operators deliver port services at the standards that our businesses deserve in the 21st century in supporting President Buhari’s administration agenda of economic diversity. “We will listen to our customers, importers, exporters and other agencies working in the Ports to improve on our service delivery to the nation, anything less than world-class services is simply not acceptable; attaining such heights is a mission to which I am certain we can all subscribe. “As team leader, I have come to add my best efforts to yours so that we can collectively achieve results for our industry. We must work as a team, pursuing common goals with professionalism and diligence. We shall prioritize investment in primary equipment and infrastructure and services committed to by NPA in the concession agreements to hasten clearance of imports and exports from the ports. As we collaborate in the best traditions of public service, I believe that with commitment and diligence our hard work can position NPA as a model agency. “To function as effective regulators, all of us at NPA must commit to the highest standards of performance and cohesion. Let us all uphold the most diligent work ethic, in our individual beats as well as in the collective undertakings required to achieve results. “Everyone at the NPA has a role in promoting best practice, in upholding governance standards and in delivering quality services. We will work hard, with integrity and with zero-tolerance for corruption.